The 29 metre motor yacht Serenity II, listed for sale by Northrop & Johnson, has been sold in an in-house deal with Kristen Klein acting for both buyer and seller. Built in GRP by US yard Admiral Marine to a design by Jack Sarin, Serenity II was delivered in 2009 and most recently refitted in 2016, when she received a complete cosmetic makeover. The interior, designed by Jon Pokela, accommodates six guests in three cabins consisting of a main-deck master suite and two doubles, all with entertainment centres, television screens and en-suite bathroom facilities. There are also quarters for five crew. The main saloon is a relaxing space to watch a film on the 43-inch LG television screen, enjoy a chat, or play the piano, with a small bar separating the lounge area from the dining saloon forward. The dining space offers seating for eight guests with custom built-in china and crystal storage, and the entire space is flooded with excellent levels of natural light filtering in through large rectangular windows. Outside, there is al fresco entertaining and dining for up to 12 guests on the main deck aft and she has full walk-around side decks. Serenity II comes equipped with economical twin Caterpillar 540hp diesel engines giving a top speed of 14 knots, a cruising speed of 10 knots and a maximum range of 5,000 nautical miles. 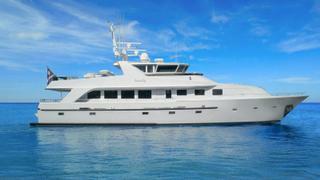 Serenity II was asking $995,000.